Wayne and Eileen Hayes appear to be the ideal couple. They have a successful business, live in a wealthy Pittsburgh suburb, and have two well-adjusted grown children. But when Wayne is kidnapped at gunpoint and held for ransom by a former employee, cracks in their armor begin to show. Based on the kidnapping of a Dutch industrialist, Pieter Jan Brugge's The Clearing shows two different takes on the American dream. 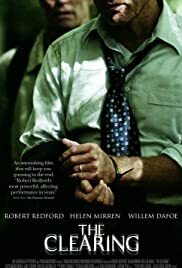 Robert Redford plays Wayne, a self-made car-rental executive who has become emotionally estranged from his wife and children. 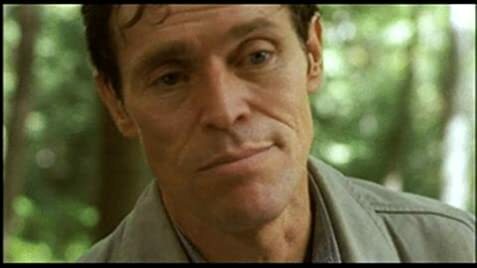 Willem Dafoe plays Arnold Mack, an unemployed man who sees himself as a failure and is unable to handle the success of his one-time employer. The film tells parallel stories that operate in different time frames, a unique device that deepens the puzzle. One thread revolves around Wayne, handcuffed and held at gunpoint by Arnold, being led through an area near the Great Smoky Mountains. The other revolves around Eileen (Helen Mirren) and her interactions with FBI investigator Ray Fuller (Matt Craven) who has set up his unit as a control center inside the Hayes home while the couple's children look on. Redford is outstanding as the intense business tycoon, and Mirren gives one of her best performances, portraying a tightly controlled suburbanite wife who refuses to panic even when her husband misses a dinner party she told him to be on time for. She keeps going even when it is obvious that something has gone wrong -- swimming in her pool, holding a birthday party for her grandchild, and waiting before calling the police because she thinks that her husband may have left her. 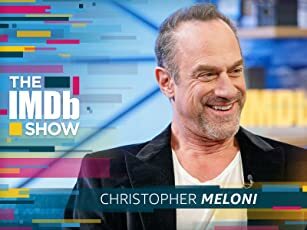 Eileen discovers through the FBI search of phone records that her husband has continued seeing another woman, a relationship he'd told her was broken off. She visits Wayne's mistress (Wendy Crewson), and retains her composure, showing emotion only in the way that she purses her lips. Always self-assured, she wants to know only where their trysts had taken place and what gifts he had brought her. As Wayne and his abductor walk through the forest, they engage in conversations about their lives and about opportunity in America. Wayne says that he made himself what he is today, and that Arnold had the same opportunity but failed. Both play a cat-and-mouse game, but treat each other with grudging respect, and it is clear that they've both paid a price. Wayne admits that his he has lost the love of his wife because of his overindulgence in his work, and the lack of attention he paid to his children. He tells Arnold, "I love my wife... we have two beautiful kids, and I'm just getting to know them." The Clearing is a quiet, thoughtful film that slowly builds suspense that is not released until the very end. Although there are some contrivances in the plot, the acting is superb throughout and the film works as a psychological thriller, a meditation on loss and regret, and a character study of two flawed but loving people who have forgotten how to express their joy in living. 74 of 92 people found this review helpful. Was this review helpful to you?